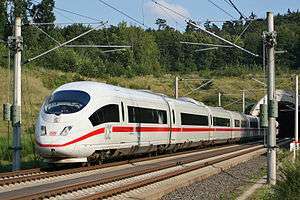 Deutsche Bahn (literally "German Railway" in German) came into existence in 1994 as the successor to the former state railways of Germany, the Deutsche Bundesbahn ("German Federal Railway") of West Germany and the Deutsche Reichsbahn ("German State Railway") of East Germany. It also gained ownership of former railway assets in West Berlin held by the Verwaltung des ehemaligen Reichsbahnvermögens (Administration of the Former Reichsbahn Assets). At its creation, Deutsche Bahn took over the abbreviation and logo DB from the West German state railway Deutsche Bundesbahn, and Kurt Weidemann later modernised the logo. Erik Spiekermann designed the new corporate font DB Type. 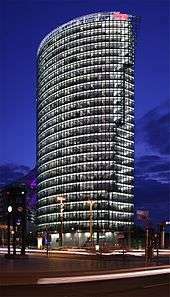 Originally, DBAG had its headquarters in Frankfurt am Main but moved to Potsdamer Platz in central Berlin in 1996, where it occupies a 26-storey office tower designed by Helmut Jahn at the eastern end of the Sony Center and named BahnTower. As the lease was to expire in 2010, DB had announced plans to relocate to Berlin Hauptbahnhof, and in 2007 a proposal for a new headquarters by 3XN Architects won an architectural competition which also included Foster + Partners, Dominique Perrault and Auer + Weber. However, these plans have been put on hold, and the BahnTower leased for at least three more years. The second step of the Bahnreform (Railway reform) was carried out in 1999. All rolling stock, track, personnel, and real assets were divided between the holding company and the five principal subsidiaries of DBAG: DB Reise & Touristik AG (long distance passenger service, later renamed DB Fernverkehr AG), DB Regio AG (regional passenger services, in the course of the reform under charge of the federal states), DB Cargo AG (freight services, later changed to Railion AG), DB Netz AG (operating the railway infrastructure), and DB Station & Service AG (operating the stations). This new organisational scheme was introduced not least to implement European Community directive 91/440/EEC that demands access to railway systems free of discrimination. In December 2007, DB reorganised again, bringing all passenger services into its DB Bahn arm, logistics under DB Schenker and infrastructure and operations under DB Netze. The DB is owned by the Federal Republic. By the Constitution, the Federal Republic is required to retain (directly or indirectly) a majority of the infrastructure (the present DB Netze) stocks. In 2008, it was agreed to partially private DB, with 25% of the business to be sold to the private sector. However the onset of the Financial crisis of 2007–08 saw this cancelled. In the World war II the Deutsche Reichsbahn helped the Nazis to deport the Jews from Greece. Since 2014, the Jewish community of Thessaloniki demands from the Deutsche Bahn which is the successor of the Deutsche Reichsbahn to reimburse to heirs of Greek Holocaust victims of Thessaloniki for train fares that they were forced to pay for their deportation from Thessaloniki to Auschwitz and Treblinka between March and August 1943. DB is organized as a business group and as of 2011 had over 1,000 affiliates, of which 287 were in Germany. The DB group (Deutsche Bahn AG) is divided into five main operations groups: Arriva, DB Bahn, DB Dienstleistungen, DB Netze, and DB Schenker. These subsidiaries are companies in their own right, although most of them are 100% owned by DBAG. Deutsche Bahn placed a bid in May 2010 for the UK-based transport company Arriva. Arriva runs bus and rail companies in 12 European countries. The merger was approved by the European Commission in August 2010, subject to DB divesting Arriva services in Germany (these are now run as Netinera). The merger became effective on 27 August 2010. Services in the UK formerly run as DB Regio are now operated by a new subdivision of the company, Arriva UK Trains. It operates the Arriva Trains Wales, Chiltern Railways, CrossCountry, Grand Central and Tyne & Wear Metro operations. 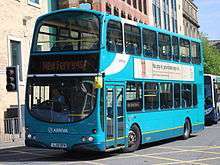 On 1 April 2016 Arriva became the operator of the Northern rail franchise. It also holds a 50% shareholding in London Overground Rail Operations and has lodged an application to operate services under the Great North Western Railway brand. In November 2016, Arriva Rail London will commence operating the London Overground concession in its own right. DB Bahn is the group that manages passenger travel within Germany. Originally called Reise & Touristik, this group is responsible for the managing, ticketing, servicing and running of German passenger services. The group also handles the information and customer service side of the operation. This group is divided into two business areas: DB Fernverkehr and DB Regio. DB Fernverkehr AG is a semi-independent division of Deutsche Bahn that operates long-distance passenger trains in Germany. It was founded in 1999 in the second stage of the privatisation of German Federal Railways under the name of DB Reise&Touristik and renamed in 2003. DB Fernverkehr operates all InterCityExpress and InterCity trains in Germany as well as several EuroCity trains throughout Europe. Unlike its sister companies DB Regio and DB Schenker, DB Fernverkehr still holds a de facto monopoly in its segment of the market as it operates hundreds of trains per day, while all competitors' long-distance services (Veolia Verkehr most notably) combined amount to no more than 10-15 trains per day. Additionally DB Fernverkehr operates a few long-distance coach services throughout Germany, called IC Bus. The bus services consist of 25 bus companies, which have subsidiary companies themselves. DB Stadtverkehr was responsible for commuter services of the Berlin and Hamburg S-Bahn networks and numerous bus companies. The subsidiary was integrated into DB Regio on 31 December 2010. The two S-Bahn networks handled and still handle over 500 million passengers annually. Since the end of 2007 DB Netze has been responsible for infrastructure and operations, taking over from DB Netz AG. Its business areas including DB Netze Fahrweg, DB Netze Energie, DB Netze Personenbahnhöfe, DB ProjektBau and DB Station&Service. A further business area known as DB Dienstleistungen covers six different areas of operations: DB Fahrzeuginstandhaltung, DB Systel, DB Services, DB Fuhrpark, DB Kommunikationstechnik, and DB Sicherheit. DB Schenker is the logistics arm of DB, as of 2008 it employed over 88,000 people, and was the largest European rail freight company. Its two business areas are DB Schenker Rail (formerly Railion.) and DB Schenker Logistics. Other subsidiaries include Bax Global, Transfesa, and the former English Welsh & Scottish, now DB Cargo UK DB Schenker Rail has its head office in Mainz, and is the holding company for the five (at 1 January 2009) national subsidiaries: Railion Deutschland, Railion Nederland, Railion Danmark, Railion Italy, and Railion Schweiz. DB also has interests abroad, owning the United Kingdom's largest rail freight operator, DB Cargo UK, which also operates the British Royal Train and also has interests in Eastern Europe. It is possible to obtain train times for any journey in Europe from Deutsche Bahn's website. Trans-Eurasia Logistics is a joint venture with Russian Railways (RŽD) that operates container freight trains between Germany and China via Russia. SE (Stadt-Express) operated as a mixture of RE and RB: trains skipped many stations in urban areas but made all stops in the countryside. Rebranded as RE and RB. In some regions, such as Rhine-Main (Frankfurt, Rhein-Main-Verkehrsverbund), the local transit authority still advertises trains as SE. Internally, DB classifies them as either RE or RB, but even DB trains display "SE" on their destination boards. There are several other operators in Germany which might offer other categories, also, a local transport authority or tariff associations might call the trains in a different way than DB does. For example, in the Nuremberg region and formally also in the Hamburger Verkehrsverbund region, RE and RB trains are not differentiated, but called R instead. In some regions, such as Verkehrsverbund Berlin-Brandenburg, private operators do use the RE and RB labels, in others, such as Saxony, they do not. In online and print information systems of DB, private trains officially labelled RB and RE by their operators, might get a different label, for example "ABR" for trains operated by Abellio, though on platforms, trains and maps or timetables issued by the local transport authority overseeing regional train services, these abbreviations usually do not appear. In conjunction with Emirates, China Airlines, TAM Airlines, Biman Bangladesh Airlines, and Lufthansa, Deutsche Bahn operates the AiRail Service between Frankfurt Airport and Cologne/Bonn, Düsseldorf, Freiburg, Hamburg, Hanover, Mannheim, Munich, Nuremberg, and Stuttgart. Deutsche Bahn has the IATA designator 2A. 1 2 3 Deutsche Bahn AG. "Annual Report 2013" (PDF). Retrieved 2013-04-09. ↑ Zug der Erinnerung/Thessaloniki Zug der Erinnerung (non-government organisation “Train of Commemoration”). 1 2 3 4 5 6 Deutsche Bahn AG. "Deutsche Bahn – The Board of Management of Deutsche BahnAG". Retrieved 2015-04-09. 1 2 3 4 5 6 Deutsche Bahn AG. "DB Mobility Logistics Facts and figures 2012" (PDF). Retrieved 2013-07-07. ↑ "Deutsche Bahn räumt bei Tochtergesellschaften auf (German Rail to clean up its subsidiaries)". 21 July 2011. Archived from eurailpress.de the original Check |url= value (help) on November 13, 2011. ↑ "EC approves DB's takeover of Arriva". Railway Gazette International. London. 11 August 2010. Retrieved 2010-08-19. ↑ Macalister, Terry (28 June 2007). "Deutsche Bahn to run Queen's train". guardian.co.uk (web only). Wikimedia Commons has media related to Deutsche Bahn.